Download "VII. 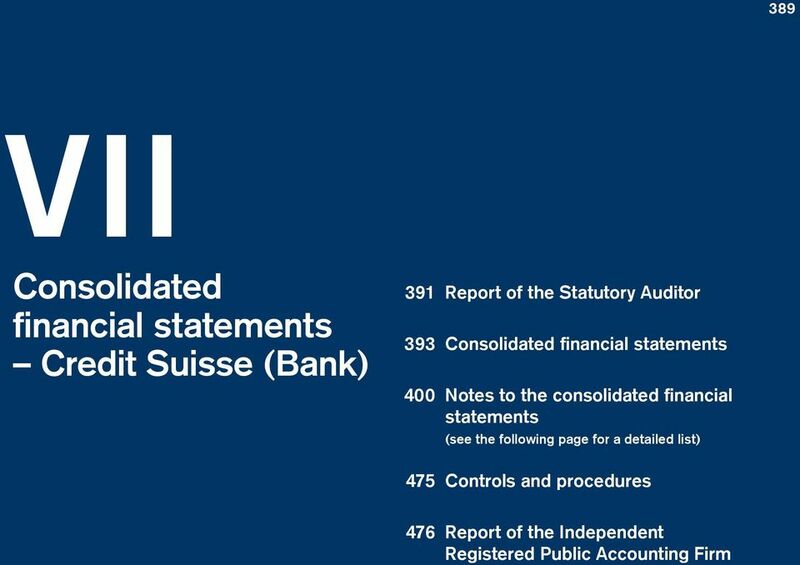 Consolidated financial statements Credit Suisse (Bank) 391 Report of the Statutory Auditor. 393 Consolidated financial statements"
5 Consolidated financial statements Credit Suisse (Bank) 393 Consolidated financial statements Consolidated statements of operations Reference to notes Consolidated statements of operations (CHF million) Interest and dividend income 6 18,585 19,017 21,539 Interest expense 6 (9,908) (11,307) (14,757) Net interest income 6 8,677 7,710 6,782 Commissions and fees 7 12,887 13,057 12,543 Trading revenues 8 1,790 2,755 1,163 Other revenues 9 2,235 1,792 2,488 Net revenues 25,589 25,314 22,976 Provision for credit losses Compensation and benefits 11 11,382 11,187 12,219 General and administrative expenses 12 9,573 8,654 7,205 Commission expenses 1,548 1,726 1,685 Total other operating expenses 11,121 10,380 8,890 Total operating expenses 22,503 21,567 21,109 Income from continuing operations before taxes 2,961 3,654 1,779 Income tax expense 26 1,299 1, Income from continuing operations 1,662 2,484 1,414 Income/(loss) from discontinued operations, net of tax (40) Net income 1,764 2,629 1,374 Net income attributable to noncontrolling interests Net income/(loss) attributable to shareholder 1,319 1,960 1,041 of which from continuing operations 1,217 1,815 1,081 of which from discontinued operations (40) in Consolidated statements of comprehensive income in Comprehensive income (CHF million) Net income 1,764 2,629 1,374 Gains/(losses) on cash flow hedges (27) 2 7 Foreign currency translation 2,284 (2,234) (1,252) Unrealized gains/(losses) on securities 21 (18) (43) Actuarial gains/(losses) 58 (43) 59 Net prior service credit/(cost) 14 0 (1) Other comprehensive income/(loss), net of tax 2,350 (2,293) (1,230) Comprehensive income 4, Comprehensive income attributable to noncontrolling interests Comprehensive income/(loss) attributable to shareholder 3,500 (298) 49 The accompanying notes to the consolidated financial statements are an integral part of these statements. 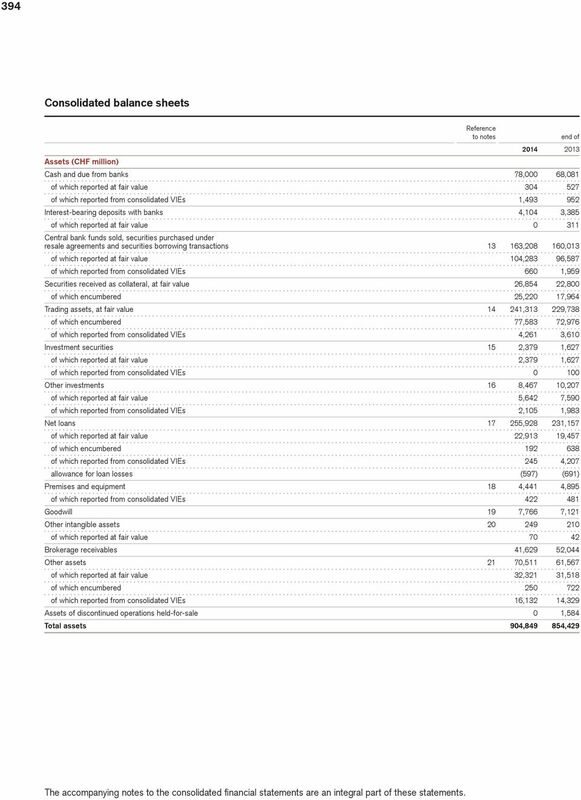 6 394 Consolidated balance sheets Assets (CHF million) Reference to notes end of Cash and due from banks 78,000 68,081 of which reported at fair value of which reported from consolidated VIEs 1, Interest-bearing deposits with banks 4,104 3,385 of which reported at fair value Central bank funds sold, securities purchased under resale agreements and securities borrowing transactions , ,013 of which reported at fair value 104,283 96,587 of which reported from consolidated VIEs 660 1,959 Securities received as collateral, at fair value 26,854 22,800 of which encumbered 25,220 17,964 Trading assets, at fair value , ,738 of which encumbered 77,583 72,976 of which reported from consolidated VIEs 4,261 3,610 Investment securities 15 2,379 1,627 of which reported at fair value 2,379 1,627 of which reported from consolidated VIEs Other investments 16 8,467 10,207 of which reported at fair value 5,642 7,590 of which reported from consolidated VIEs 2,105 1,983 Net loans , ,157 of which reported at fair value 22,913 19,457 of which encumbered of which reported from consolidated VIEs 245 4,207 allowance for loan losses (597) (691) Premises and equipment 18 4,441 4,895 of which reported from consolidated VIEs Goodwill 19 7,766 7,121 Other intangible assets of which reported at fair value Brokerage receivables 41,629 52,044 Other assets 21 70,511 61,567 of which reported at fair value 32,321 31,518 of which encumbered of which reported from consolidated VIEs 16,132 14,329 Assets of discontinued operations held-for-sale 0 1,584 Total assets 904, ,429 The accompanying notes to the consolidated financial statements are an integral part of these statements. 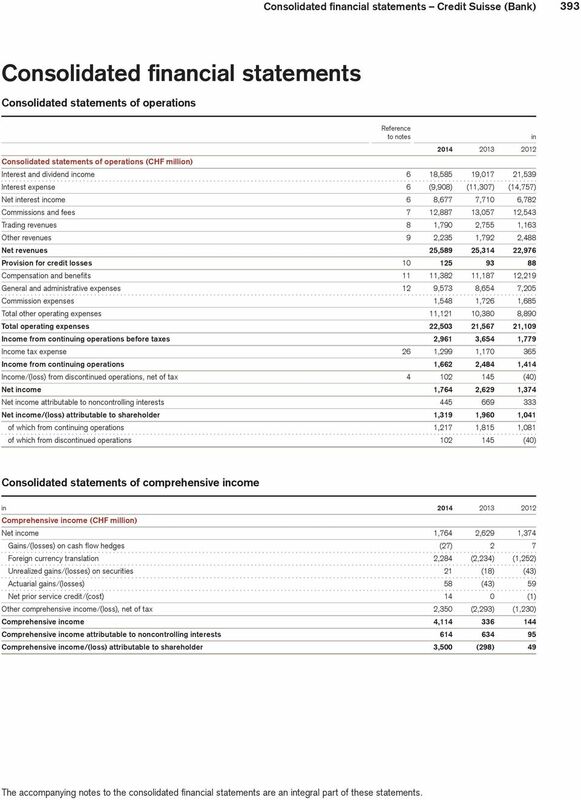 7 Consolidated financial statements Credit Suisse (Bank) 395 Consolidated balance sheets (continued) Liabilities and equity (CHF million) Reference to notes end of Due to banks 22 26,506 23,147 of which reported at fair value 832 1,460 Customer deposits , ,678 of which reported at fair value 3,251 3,241 of which reported from consolidated VIEs Central bank funds purchased, securities sold under repurchase agreements and securities lending transactions 13 70,119 94,032 of which reported at fair value 54,732 76,104 Obligation to return securities received as collateral, at fair value 26,854 22,800 Trading liabilities, at fair value 14 72,667 76,812 of which reported from consolidated VIEs Short-term borrowings 25,921 20,193 of which reported at fair value 3,861 6,053 of which reported from consolidated VIEs 9,384 4,286 Long-term debt , ,741 of which reported at fair value 80,260 62,462 of which reported from consolidated VIEs 13,452 12,992 Brokerage payables 56,977 73,154 Other liabilities 21 50,648 51,100 of which reported at fair value 16,933 21,971 of which reported from consolidated VIEs 1, Liabilities of discontinued operations held-for-sale 0 1,140 Total liabilities 860, ,797 Common shares / participation securities 4,400 4,400 Additional paid-in capital 34,842 34,851 Retained earnings 15,877 14,621 Accumulated other comprehensive income/(loss) 24 (12,224) (14,405) Total shareholder s equity 42,895 39,467 Noncontrolling interests 1,746 4,165 Total equity 44,641 43,632 Total liabilities and equity 904, ,429 end of Additional share information Par value (CHF) Issued shares 4,399,680,200 4,399,665,200 Shares outstanding 4,399,680,200 4,399,665,200 The Bank s total share capital is fully paid and consists of 4,399,680,200 registered shares as of December 31, Each share is entitled to one vote. The Bank has no warrants on its own shares outstanding. 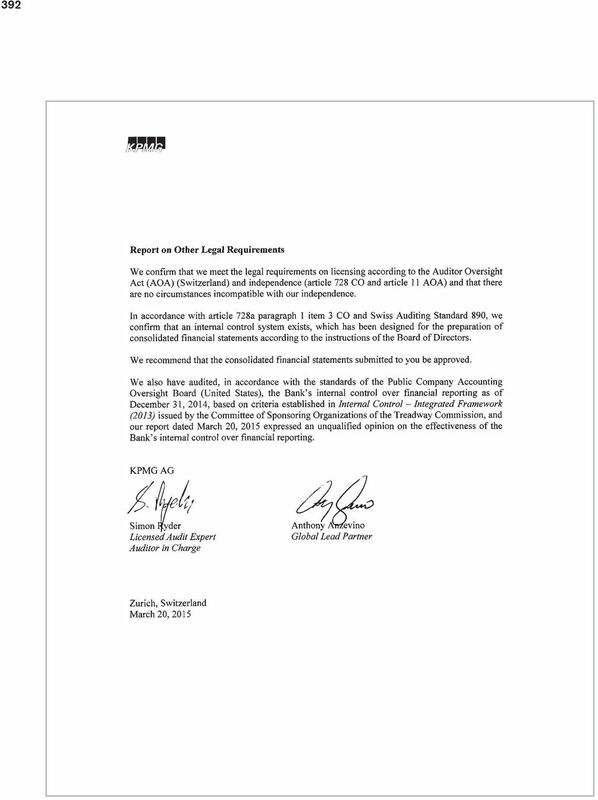 The accompanying notes to the consolidated financial statements are an integral part of these statements. 8 396 Consolidated statements of changes in equity 2014 (CHF million) Attributable to shareholder Common Accumushares/ lated other Total participa- Additional Treasury compre- share- Nontion secu- paid-in Retained shares, hensive holder s controlling Total rities capital earnings at cost 1 income equity interests equity Balance at beginning of period 4,400 34,851 14,621 0 (14,405) 39,467 4,165 43,632 Purchase of subsidiary shares from noncontrolling interests, changing ownership Purchase of subsidiary shares from noncontrolling interests, not changing ownership 2, 3 (578) (578) Sale of subsidiary shares to noncontrolling interests, not changing ownership Net income/(loss) 1,319 1, ,764 Total other comprehensive income/(loss), net of tax 2,181 2, ,350 Share-based compensation, net of tax (61) 4 (61) (61) Dividends on share-based compensation, net of tax (44) (44) (44) Dividends paid (63) (63) (21) (84) Changes in redeemable noncontrolling interests Changes in scope of consolidation, net (2,477) (2,477) Other Balance at end of period 4,400 34,842 15,877 0 (12,224) 42,895 1,746 44, (CHF million) Balance at beginning of period 4,400 29,365 13,086 0 (12,147) 34,704 8,179 42,883 Purchase of subsidiary shares from noncontrolling interests, changing ownership (22) (22) Purchase of subsidiary shares from noncontrolling interests, not changing ownership (5,060) (5,060) Sale of subsidiary shares to noncontrolling interests, not changing ownership Net income/(loss) 1,960 1, ,642 Total other comprehensive income/(loss), net of tax (2,258) (2,258) (35) (2,293) Cancellation of repurchased shares (445) (445) (445) Share-based compensation, net of tax Dividends on share-based compensation, net of tax (87) (87) (87) Dividends paid (424) (424) (59) (483) Changes in redeemable noncontrolling interests (13) (13) (13) Changes in scope of consolidation, net (211) (211) Other 5,835 (1) 5,834 (2) 5,832 Balance at end of period 4,400 34,851 14,621 0 (14,405) 39,467 4,165 43,632 1 Reflects Credit Suisse Group shares which are reported as treasury shares. Those shares are held to economically hedge share award obligations. 2 Distributions to owners in funds include the return of original capital invested and any related dividends. 3 Transactions with and without ownership changes related to fund activity are all displayed under not changing ownership. 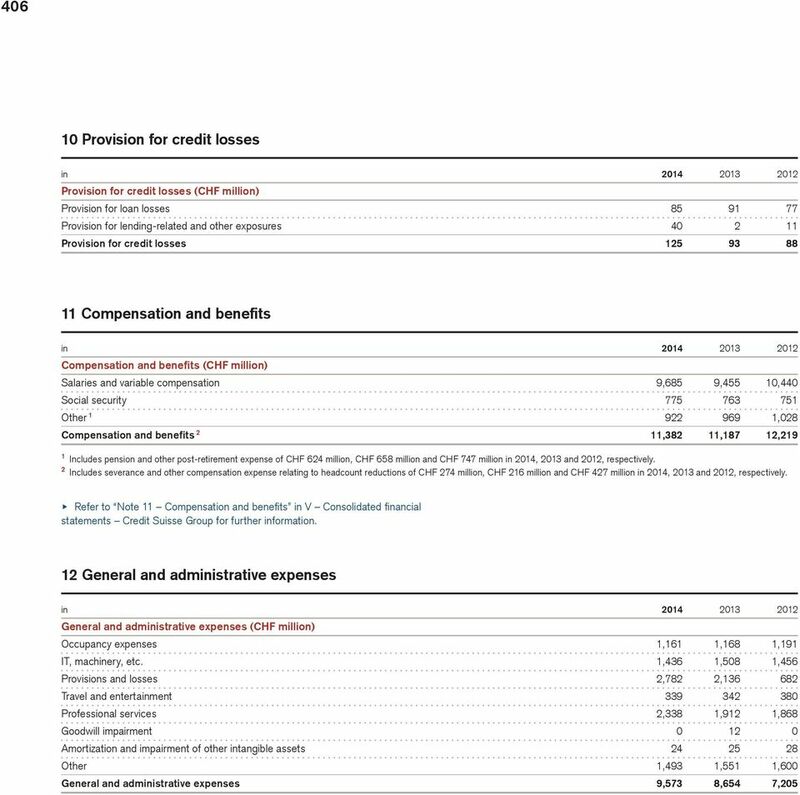 4 Includes a net tax charge of CHF (69) million from the excess recognized compensation expense over fair value of shares delivered. The accompanying notes to the consolidated financial statements are an integral part of these statements. 9 Consolidated financial statements Credit Suisse (Bank) 397 Consolidated statements of changes in equity (continued) 2012 (CHF million) Attributable to shareholder Common Accumushares/ lated other Total participa- Additional Treasury compre- share- Nontion secu- paid-in Retained shares, hensive holder s controlling Total rities capital earnings at cost income equity interests equity Balance at beginning of period 4,400 24,813 12,328 0 (11,155) 30,386 8,948 39,334 Purchase of subsidiary shares from noncontrolling interests, changing ownership (90) 162 Purchase of subsidiary shares from noncontrolling interests, not changing ownership (875) (875) Sale of subsidiary shares to noncontrolling interests, not changing ownership Net income/(loss) 1,041 1, ,385 Total other comprehensive income/(loss), net of tax (992) (992) (238) (1,230) Share-based compensation, net of tax Dividends on share-based compensation, net of tax (50) (50) (50) Dividends paid (267) (267) (54) (321) Changes in redeemable noncontrolling interests (7) (7) (7) Changes in scope of consolidation, net (96) (96) Other 3,468 (16) 3,452 3,452 Balance at end of period 4,400 29,365 13,086 0 (12,147) 34,704 8,179 42,883 The accompanying notes to the consolidated financial statements are an integral part of these statements. 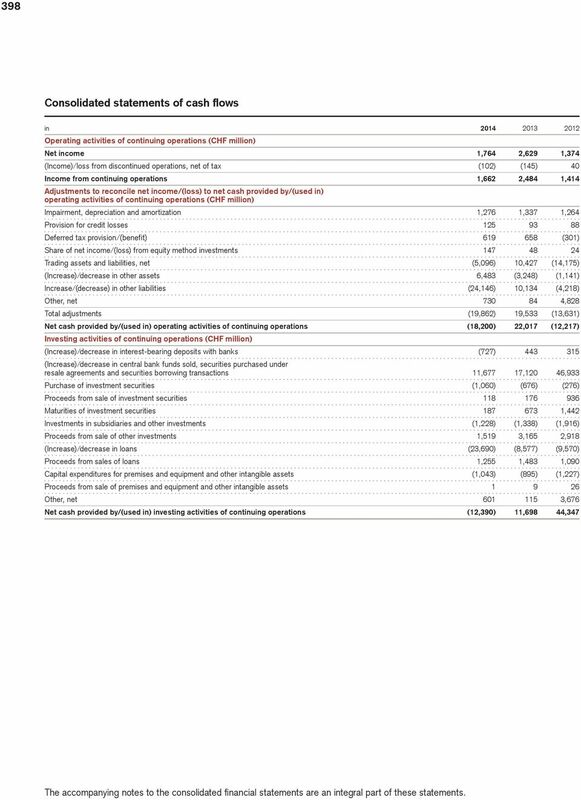 10 398 Consolidated statements of cash flows in Operating activities of continuing operations (CHF million) Net income 1,764 2,629 1,374 (Income)/loss from discontinued operations, net of tax (102) (145) 40 Income from continuing operations 1,662 2,484 1,414 Adjustments to reconcile net income/(loss) to net cash provided by/(used in) operating activities of continuing operations (CHF million) Impairment, depreciation and amortization 1,276 1,337 1,264 Provision for credit losses Deferred tax provision/(benefit) (301) Share of net income/(loss) from equity method investments Trading assets and liabilities, net (5,096) 10,427 (14,175) (Increase)/decrease in other assets 6,483 (3,248) (1,141) Increase/(decrease) in other liabilities (24,146) 10,134 (4,218) Other, net ,828 Total adjustments (19,862) 19,533 (13,631) Net cash provided by/(used in) operating activities of continuing operations (18,200) 22,017 (12,217) Investing activities of continuing operations (CHF million) (Increase)/decrease in interest-bearing deposits with banks (727) (Increase)/decrease in central bank funds sold, securities purchased under resale agreements and securities borrowing transactions 11,677 17,120 46,933 Purchase of investment securities (1,060) (676) (276) Proceeds from sale of investment securities Maturities of investment securities ,442 Investments in subsidiaries and other investments (1,228) (1,338) (1,916) Proceeds from sale of other investments 1,519 3,165 2,918 (Increase)/decrease in loans (23,690) (8,577) (9,570) Proceeds from sales of loans 1,255 1,483 1,090 Capital expenditures for premises and equipment and other intangible assets (1,043) (895) (1,227) Proceeds from sale of premises and equipment and other intangible assets Other, net ,676 Net cash provided by/(used in) investing activities of continuing operations (12,390) 11,698 44,347 The accompanying notes to the consolidated financial statements are an integral part of these statements. 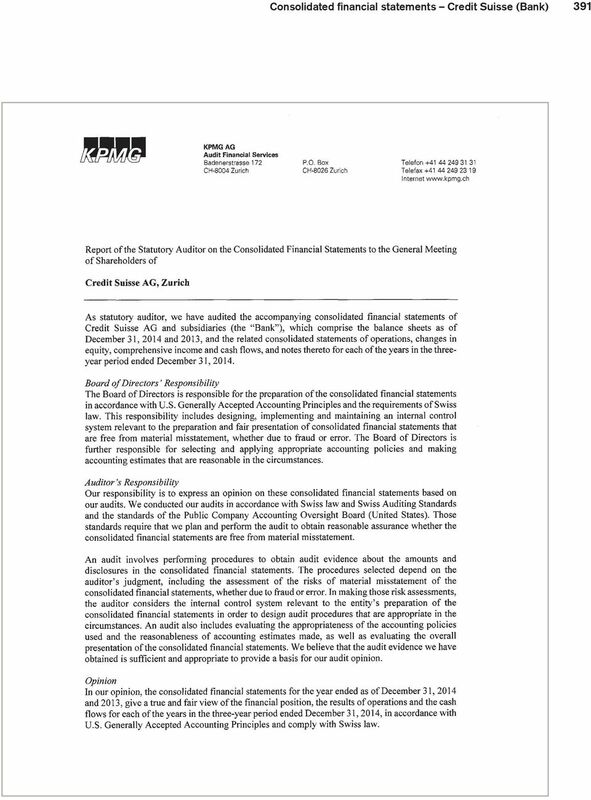 11 Consolidated financial statements Credit Suisse (Bank) 399 Consolidated statements of cash flows (continued) in Financing activities of continuing operations (CHF million) Increase/(decrease) in due to banks and customer deposits 27,137 22,630 (14,005) Increase/(decrease) in short-term borrowings 3,509 6,002 (11,643) Increase/(decrease) in central bank funds purchased, securities sold under repurchase agreements and securities lending transactions (31,001) (36,347) (39,958) Issuances of long-term debt 74,150 37,914 37,235 Repayments of long-term debt (37,871) (55,216) (55,401) Dividends paid (84) (483) (321) Excess tax benefits related to share-based compensation Other, net (488) 736 3,603 Net cash provided by/(used in) financing activities of continuing operations 35,352 (24,764) (80,448) Effect of exchange rate changes on cash and due from banks (CHF million) Effect of exchange rate changes on cash and due from banks 5,617 (1,219) (1,184) Net cash provided by/(used in) discontinued operations (CHF million) Net cash provided by/(used in) discontinued operations (460) (1,027) (346) Net increase/(decrease) in cash and due from banks (CHF million) Net increase/(decrease) in cash and due from banks 9,919 6,705 (49,848) Cash and due from banks at beginning of period 68,081 61, ,224 Cash and due from banks at end of period 78,000 68,081 61,376 Supplemental cash flow information in Cash paid for income taxes and interest (CHF million) Cash paid for income taxes 1, ,010 Cash paid for interest 9,419 11,686 14,920 Assets acquired and liabilities assumed in business acquisitions (CHF million) Fair value of assets acquired ,418 Fair value of liabilities assumed ,418 Assets and liabilities sold in business divestitures (CHF million) Assets sold Liabilities sold 1, The accompanying notes to the consolidated financial statements are an integral part of these statements. 12 400 Notes to the consolidated financial statements 1 Summary of significant accounting policies The accompanying consolidated financial statements of Credit Suisse AG (the Bank), a Swiss bank subsidiary of Credit Suisse Group AG (the Group), are prepared in accordance with accounting principles generally accepted in the US (US GAAP) and are stated in Swiss francs (CHF). The financial year for the Bank ends on December 31. In the fourth quarter of 2014, as part of an announced program to evolve the Bank s legal entity structure to meet developing and future regulatory requirements and regulation of the US Federal Reserve on establishing Intermediate Holding Companies in the US for non-us banks, several existing legal entities were re-parented as subsidiaries of Credit Suisse (USA), Inc. 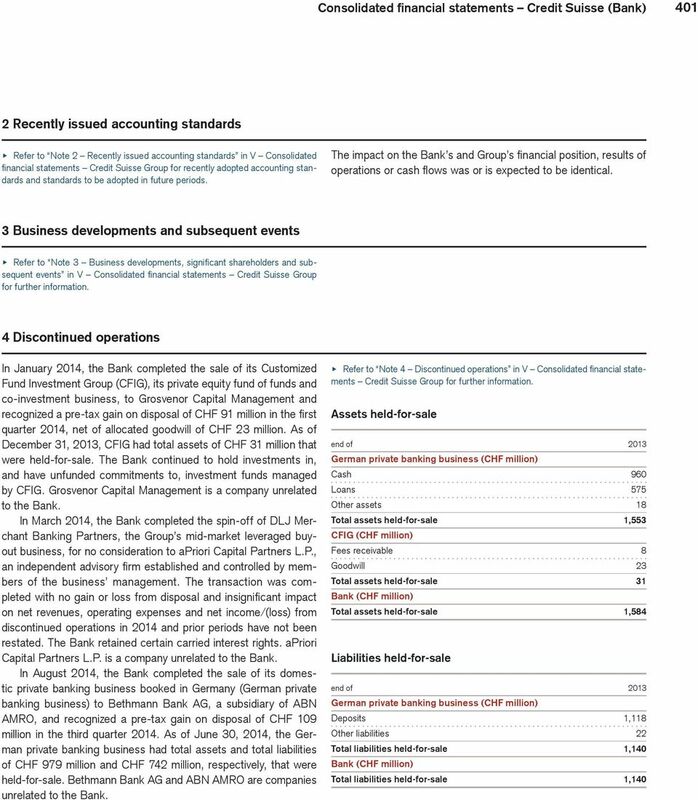 In the consolidated financial statements of the Bank, prior periods have been restated to conform to the current presentation to reflect the impact of these transactions. 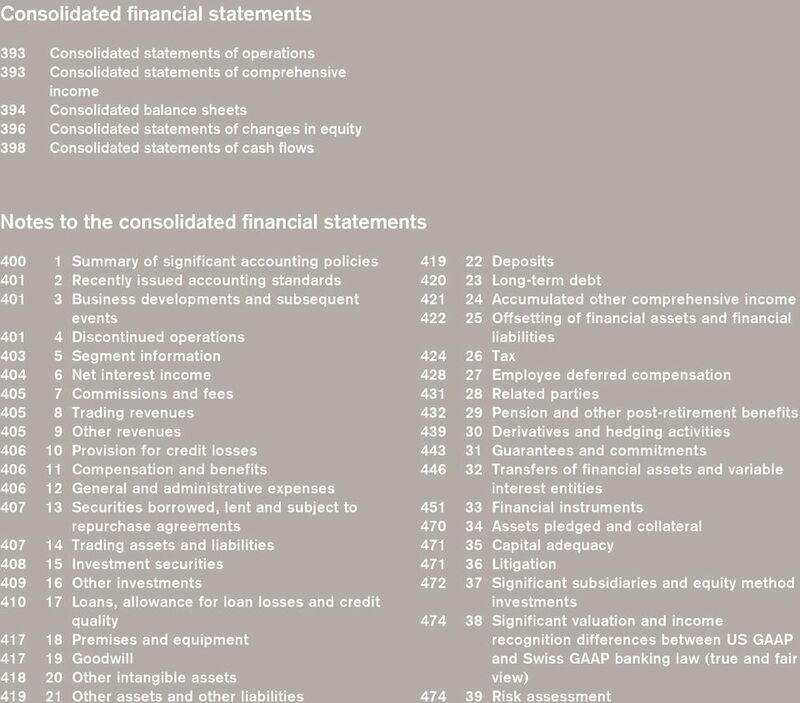 In preparing the consolidated financial statements, management is required to make estimates and assumptions including, but not limited to, the q fair value measurements of certain financial assets and liabilities, the allowance for loan losses, the evaluation of variable interest entities (VIEs), the impairment of assets other than loans, recognition of deferred tax assets, tax uncertainties, pension liabilities, as well as various contingencies. These estimates and assumptions affect the reported amounts of assets and liabilities and the disclosure of contingent assets and liabilities as of the dates of the consolidated balance sheets and the reported amounts of revenues and expenses during the reporting period. While management evaluates its estimates and assumptions on an ongoing basis, actual results could differ materially from management s estimates. Market conditions may increase the risk and complexity of the judgments applied in these estimates. 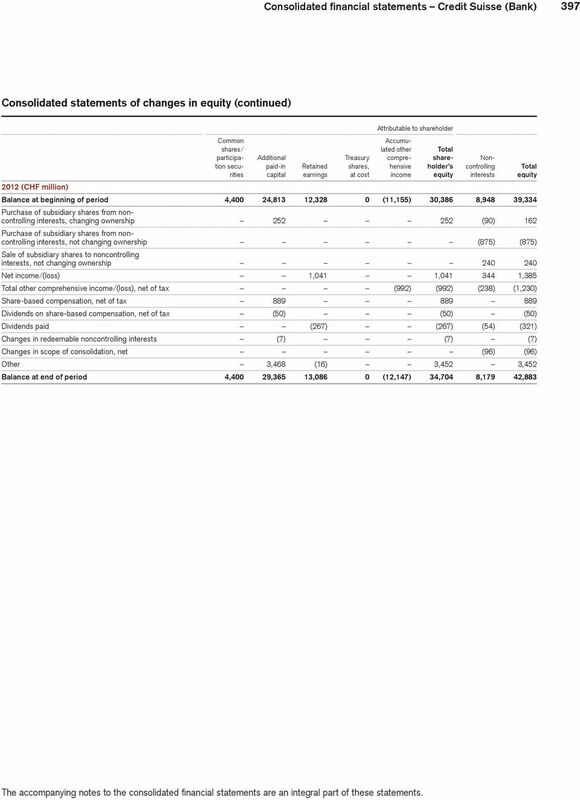 u Refer to Note 1 Summary of significant accounting policies in V Consolidated financial statements Credit Suisse Group for a summary of significant accounting policies, with the exception of the following accounting policies. 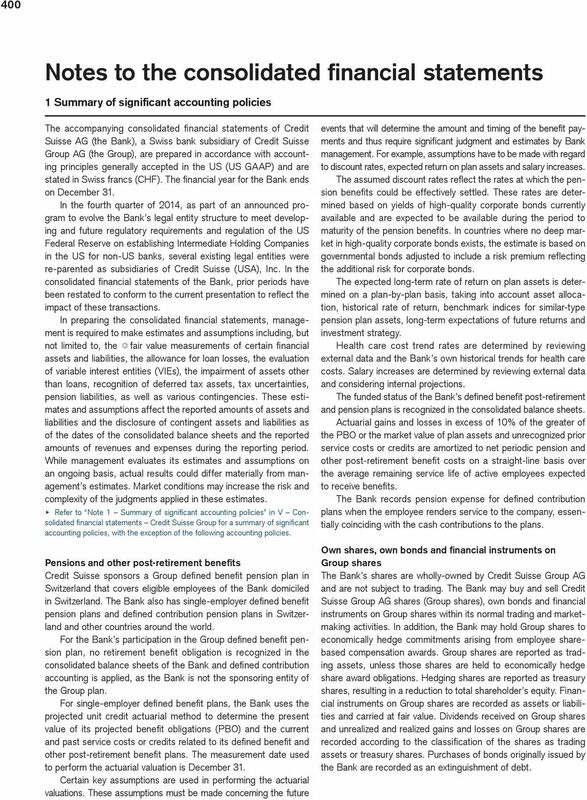 Pensions and other post-retirement benefits Credit Suisse sponsors a Group defined benefit pension plan in Switzerland that covers eligible employees of the Bank domiciled in Switzerland. The Bank also has single-employer defined benefit pension plans and defined contribution pension plans in Switzerland and other countries around the world. For the Bank s participation in the Group defined benefit pension plan, no retirement benefit obligation is recognized in the consolidated balance sheets of the Bank and defined contribution accounting is applied, as the Bank is not the sponsoring entity of the Group plan. For single-employer defined benefit plans, the Bank uses the projected unit credit actuarial method to determine the present value of its projected benefit obligations (PBO) and the current and past service costs or credits related to its defined benefit and other post-retirement benefit plans. The measurement date used to perform the actuarial valuation is December 31. Certain key assumptions are used in performing the actuarial valuations. These assumptions must be made concerning the future events that will determine the amount and timing of the benefit payments and thus require significant judgment and estimates by Bank management. For example, assumptions have to be made with regard to discount rates, expected return on plan assets and salary increases. The assumed discount rates reflect the rates at which the pension benefits could be effectively settled. These rates are determined based on yields of high-quality corporate bonds currently available and are expected to be available during the period to maturity of the pension benefits. In countries where no deep market in high-quality corporate bonds exists, the estimate is based on governmental bonds adjusted to include a risk premium reflecting the additional risk for corporate bonds. The expected long-term rate of return on plan assets is determined on a plan-by-plan basis, taking into account asset allocation, historical rate of return, benchmark indices for similar-type pension plan assets, long-term expectations of future returns and investment strategy. Health care cost trend rates are determined by reviewing external data and the Bank s own historical trends for health care costs. Salary increases are determined by reviewing external data and considering internal projections. The funded status of the Bank s defined benefit post-retirement and pension plans is recognized in the consolidated balance sheets. Actuarial gains and losses in excess of 10% of the greater of the PBO or the market value of plan assets and unrecognized prior service costs or credits are amortized to net periodic pension and other post-retirement benefit costs on a straight-line basis over the average remaining service life of active employees expected to receive benefits. The Bank records pension expense for defined contribution plans when the employee renders service to the company, essentially coinciding with the cash contributions to the plans. Own shares, own bonds and financial instruments on Group shares The Bank s shares are wholly-owned by Credit Suisse Group AG and are not subject to trading. The Bank may buy and sell Credit Suisse Group AG shares (Group shares), own bonds and financial instruments on Group shares within its normal trading and marketmaking activities. In addition, the Bank may hold Group shares to economically hedge commitments arising from employee sharebased compensation awards. Group shares are reported as trading assets, unless those shares are held to economically hedge share award obligations. Hedging shares are reported as treasury shares, resulting in a reduction to total shareholder s equity. Financial instruments on Group shares are recorded as assets or liabilities and carried at fair value. Dividends received on Group shares and unrealized and realized gains and losses on Group shares are recorded according to the classification of the shares as trading assets or treasury shares. Purchases of bonds originally issued by the Bank are recorded as an extinguishment of debt. 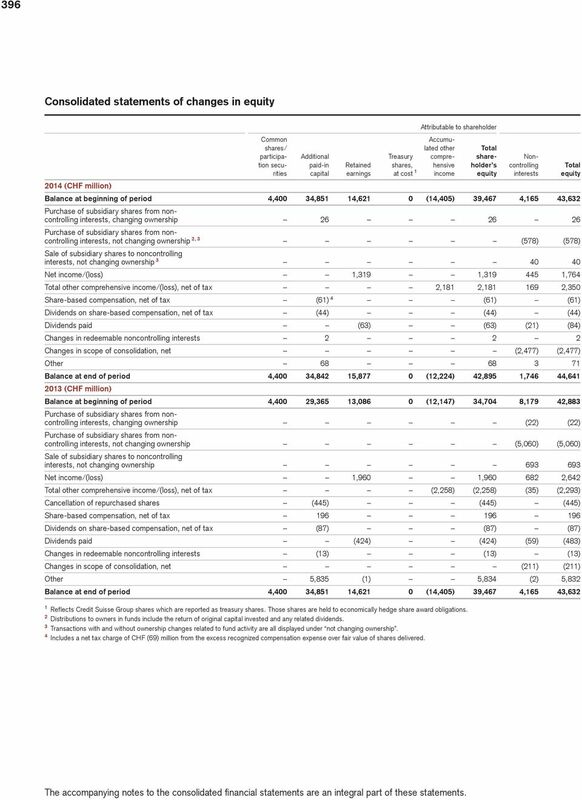 15 Consolidated financial statements Credit Suisse (Bank) Segment information For the purposes of the presentation of reportable segments, the Bank has included accounts of affiliate entities wholly owned by the same parent which are managed together with the operating segments of the Bank. These affiliate entities include certain bank and trust affiliates, primarily managed by Private Banking & Wealth Management. 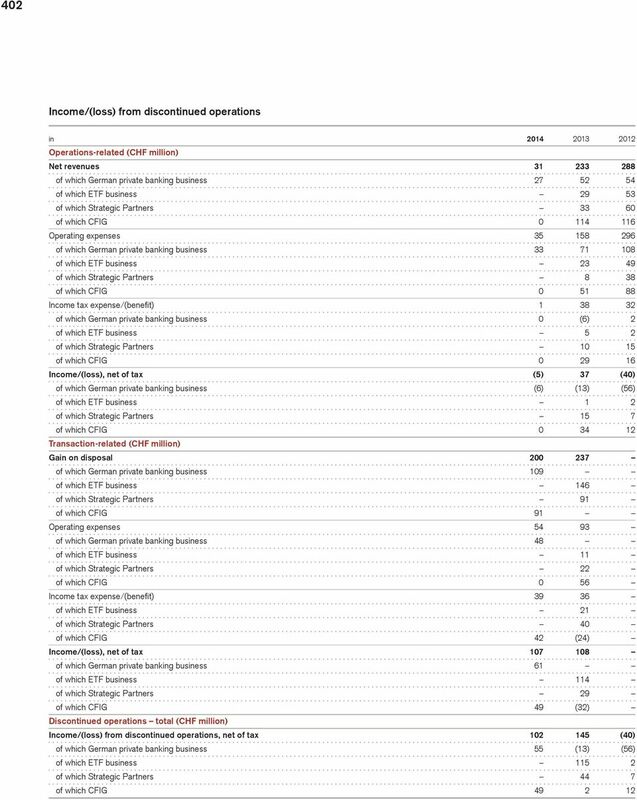 Income from continuing operations before taxes of these non-consolidated affiliate entities included in the segment presentation for the years ended December 31, 2014, 2013 and 2012 was CHF 264 million, CHF 243 million and CHF 237 million, respectively. For the same periods, net revenues of these non-consolidated affiliate entities included in the segment presentation were CHF 656 million, CHF 659 million and CHF 684 million, respectively, and total assets of these non-consolidated affiliate entities included in the segment presentation as of December 31, 2014 and 2013, were CHF 25.7 billion and CHF 25.4 billion, respectively. 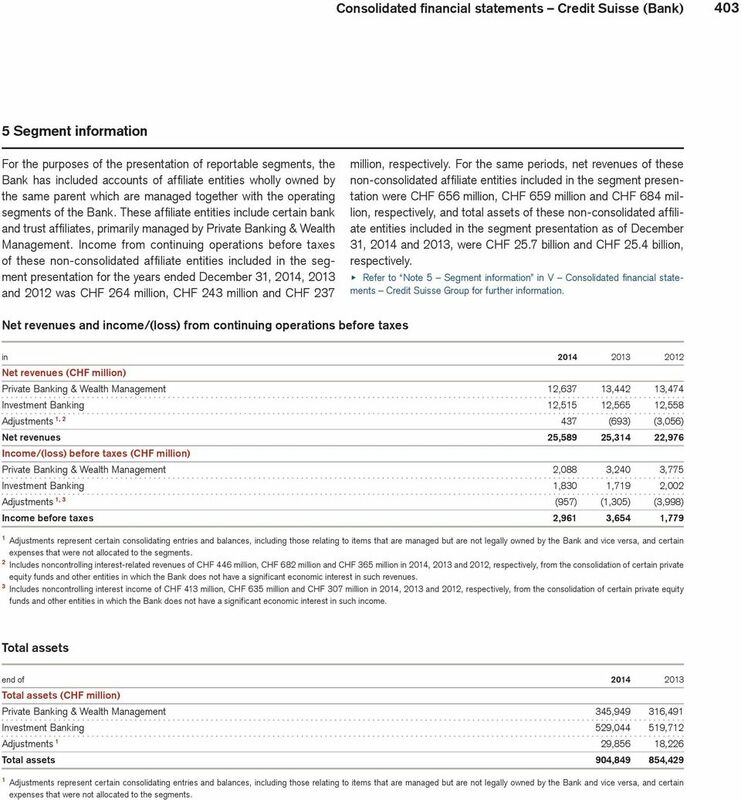 u Refer to Note 5 Segment information in V Consolidated financial statements Credit Suisse Group for further information. 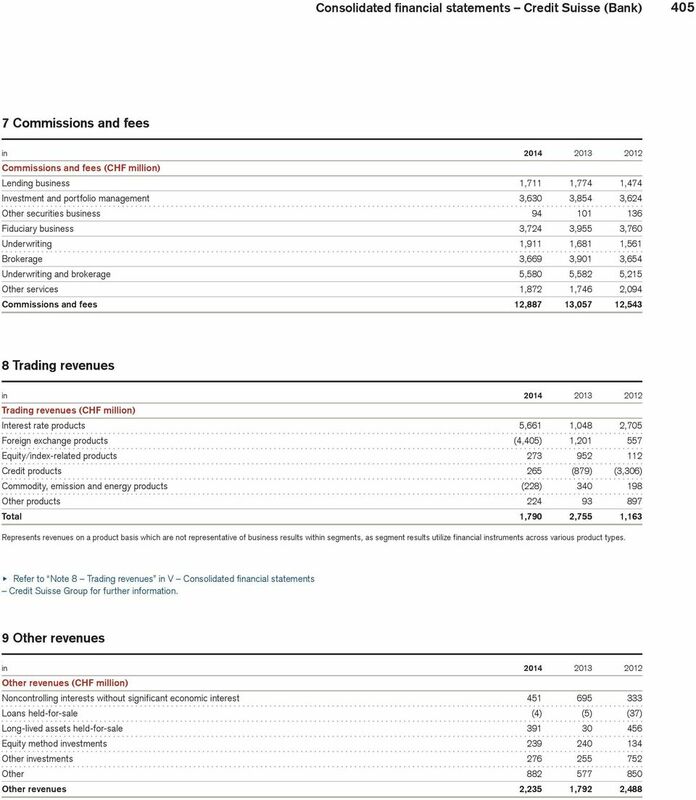 Net revenues and income/(loss) from continuing operations before taxes in Net revenues (CHF million) Private Banking & Wealth Management 12,637 13,442 13,474 Investment Banking 12,515 12,565 12,558 Adjustments 1, (693) (3,056) Net revenues 25,589 25,314 22,976 Income/(loss) before taxes (CHF million) Private Banking & Wealth Management 2,088 3,240 3,775 Investment Banking 1,830 1,719 2,002 Adjustments 1, 3 (957) (1,305) (3,998) Income before taxes 2,961 3,654 1,779 1 Adjustments represent certain consolidating entries and balances, including those relating to items that are managed but are not legally owned by the Bank and vice versa, and certain expenses that were not allocated to the segments. 2 Includes noncontrolling interest-related revenues of CHF 446 million, CHF 682 million and CHF 365 million in 2014, 2013 and 2012, respectively, from the consolidation of certain private equity funds and other entities in which the Bank does not have a significant economic interest in such revenues. 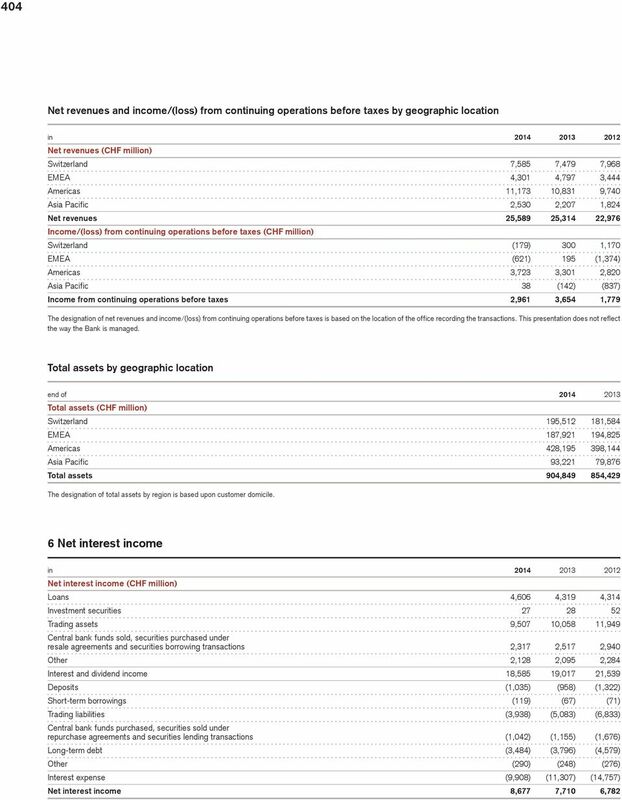 3 Includes noncontrolling interest income of CHF 413 million, CHF 635 million and CHF 307 million in 2014, 2013 and 2012, respectively, from the consolidation of certain private equity funds and other entities in which the Bank does not have a significant economic interest in such income. 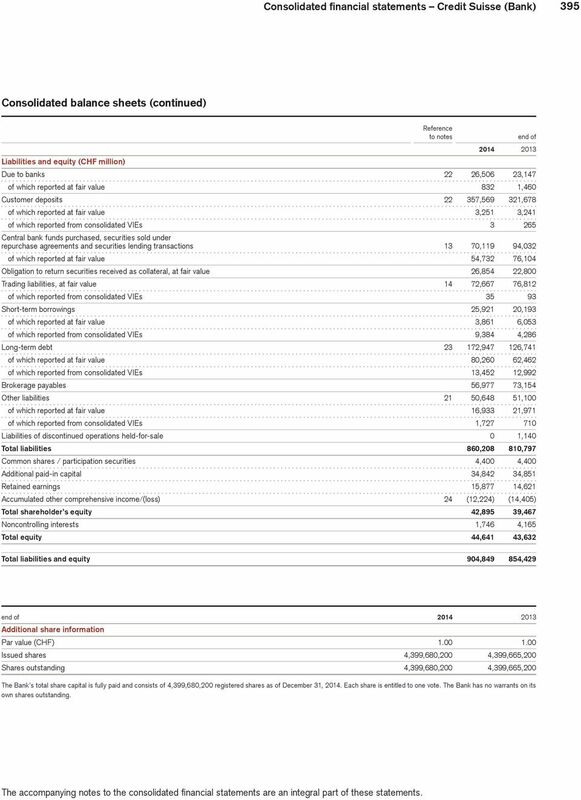 Total assets end of Total assets (CHF million) Private Banking & Wealth Management 345, ,491 Investment Banking 529, ,712 Adjustments 1 29,856 18,226 Total assets 904, ,429 1 Adjustments represent certain consolidating entries and balances, including those relating to items that are managed but are not legally owned by the Bank and vice versa, and certain expenses that were not allocated to the segments. 19 Consolidated financial statements Credit Suisse (Bank) Securities borrowed, lent and subject to repurchase agreements end of Securities borrowed or purchased under agreements to resell (CHF million) Central bank funds sold and securities purchased under resale agreements 100, ,235 Deposits paid for securities borrowed 63,039 59,778 Central bank funds sold, securities purchased under resale agreements and securities borrowing transactions 163, ,013 Securities lent or sold under agreements to repurchase (CHF million) Central bank funds purchased and securities sold under repurchase agreements 60,752 86,828 Deposits received for securities lent 9,367 7,204 Central bank funds purchased, securities sold under repurchase agreements and securities lending transactions 70,119 94,032 u Refer to Note 14 Securities borrowed, lent and subject to repurchase agreements in V Consolidated financial statements Credit Suisse Group for further information. 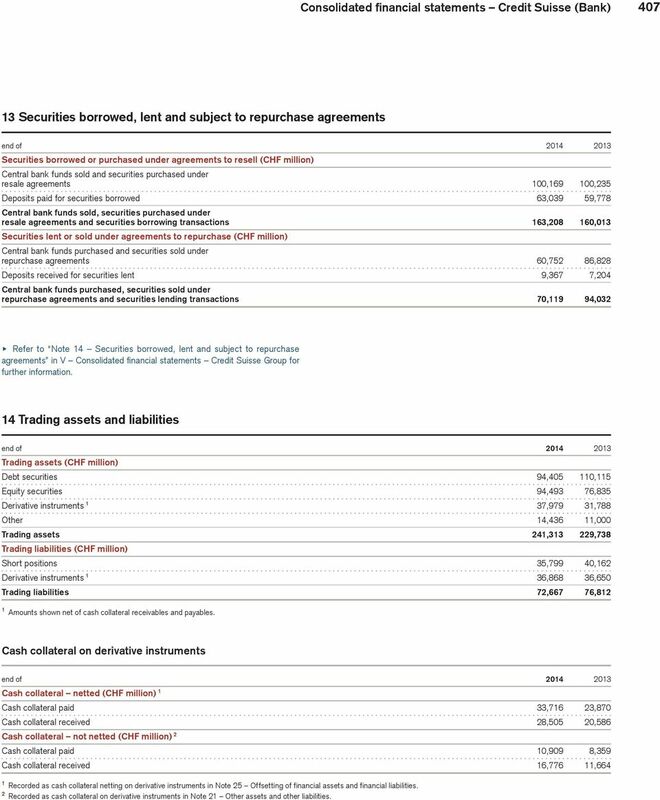 14 Trading assets and liabilities end of Trading assets (CHF million) Debt securities 94, ,115 Equity securities 94,493 76,835 Derivative instruments 1 37,979 31,788 Other 14,436 11,000 Trading assets 241, ,738 Trading liabilities (CHF million) Short positions 35,799 40,162 Derivative instruments 1 36,868 36,650 Trading liabilities 72,667 76,812 1 Amounts shown net of cash collateral receivables and payables. Cash collateral on derivative instruments end of Cash collateral netted (CHF million) 1 Cash collateral paid 33,716 23,870 Cash collateral received 28,505 20,586 Cash collateral not netted (CHF million) 2 Cash collateral paid 10,909 8,359 Cash collateral received 16,776 11,664 1 Recorded as cash collateral netting on derivative instruments in Note 25 Offsetting of financial assets and financial liabilities. Recorded as cash collateral on derivative instruments in Note 21 Other assets and other liabilities. 21 Consolidated financial statements Credit Suisse (Bank) 409 Amortized cost, fair value and average yield of debt securities Debt securities available-for-sale Average Amortized Fair yield end of cost value (in %) 2014 (CHF million) Due within 1 year Due from 1 to 5 years 1,378 1, Total debt securities 2,228 2, Other investments end of Other investments (CHF million) Equity method investments 1 3,397 2,008 Non-marketable equity securities 1, 2 2,667 5,988 Real estate held for investment Life finance instruments 3 1,896 1,654 Total other investments 8,467 10,207 1 As a result of the prospective adoption of ASU , CHF 1,033 million of non-marketable equity securities were reclassified to equity method investments for which the fair value option was elected on January 1, Includes private equity, hedge funds and restricted stock investments as well as certain investments in non-marketable mutual funds for which the Bank has neither significant influence nor control over the investee. 3 Includes life settlement contracts at investment method and SPIA contracts. Non-marketable equity securities include investments in entities that regularly calculate net asset value per share or its equivalent. u Refer to Note 33 Financial instruments for further information on such investments. Substantially all non-marketable equity securities are carried at q fair value. There were no non-marketable equity securities not carried at fair value that have been in a continuous unrealized loss position. The Bank performs a regular impairment analysis of real estate portfolios. The carrying values of the impaired properties were written down to their respective fair values, establishing a new cost base. For these properties, the fair values were measured based on either discounted cash flow analyses or external market appraisals. Impairments of CHF 10 million, CHF 48 million and CHF 13 million were recorded in 2014, 2013 and 2012, respectively. Accumulated depreciation related to real estate held for investment amounted to CHF 304 million, CHF 289 million and CHF 280 million for 2014, 2013 and 2012, respectively. 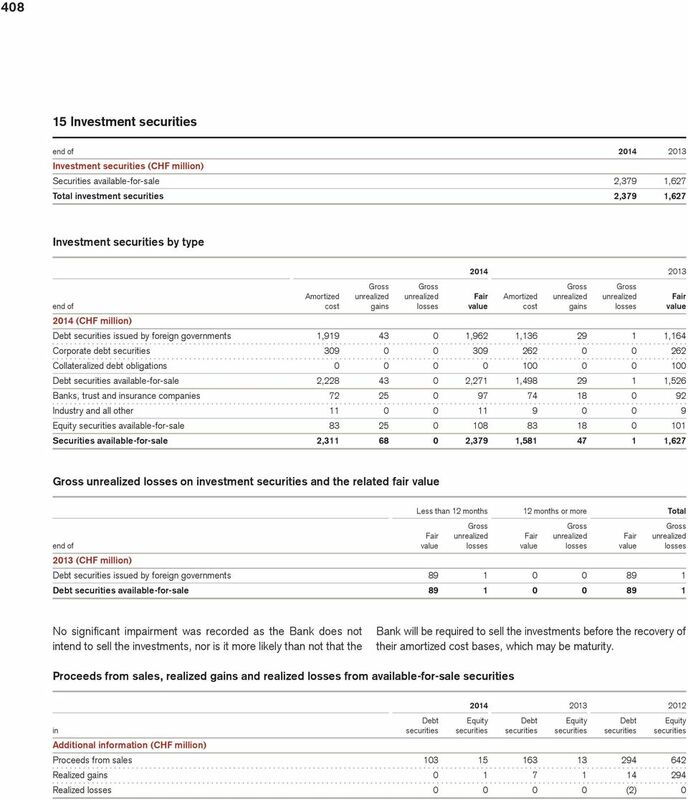 u Refer to Note 17 Other investments in V Consolidated financial statements Credit Suisse Group for further information. 23 Consolidated financial statements Credit Suisse (Bank) 411 Allowance for loan losses Allowance for loan losses (CHF million) Corporate Corporate Corporate & & & Consumer institutional Total Consumer institutional Total Consumer institutional Total Balance at beginning of period Changes in scope of consolidation (1) (1) (18) 0 (18) Net movements recognized in statements of operations Gross write-offs (35) (232) (267) (38) (147) (185) (42) (80) (122) Recoveries Net write-offs (23) (208) (231) (18) (117) (135) (23) (60) (83) Provisions for interest Foreign currency translation impact and other adjustments, net (3) (7) (10) (5) 4 (1) Balance at end of period of which individually evaluated for impairment of which collectively evaluated for impairment Gross loans held at amortized cost (CHF million) Balance at end of period 125, , , ,601 96, , ,495 98, ,613 of which individually evaluated for impairment , , ,398 of which collectively evaluated for impairment 125, , , ,247 96, , ,073 97, ,215 1 Represents gross impaired loans both with and without a specific allowance. Purchases, reclassifications and sales in Loans held at amortized cost (CHF million) Corporate Corporate Corporate & & & Consumer institutional Total Consumer institutional Total Consumer institutional Total Purchases ,127 4, ,611 4, ,605 4,953 Reclassifications from loans held-for-sale Reclassifications to loans held-for-sale 3 1, , ,323 1,323 Sales ,058 1,058 1 Includes drawdowns under purchased loan commitments. 2 Includes loans previously reclassified to held-for-sale that were not sold and were reclassified back to loans held-to-maturity. 3 All loans held at amortized cost which are sold are reclassified to loans held-for-sale on or prior to the date of the sale. 24 412 Gross loans held at amortized cost by internal counterparty rating Investment Non-investment grade grade Ratings Ratings end of AAA to BBB BB to C Rating D Total 2014 (CHF million) Mortgages 72,844 11, ,527 Loans collateralized by securities 37,338 2, ,712 Consumer finance 1, ,565 Consumer 111,417 14, ,804 Real estate 19,169 6, ,256 Commercial and industrial loans 30,156 29, ,521 Financial institutions 18,209 2, ,934 Governments and public institutions ,263 Corporate & institutional 68,384 38, ,974 Gross loans held at amortized cost 179,801 52, ,778 Value of collateral 1 162,598 43, , (CHF million) Mortgages 68,132 12, ,115 Loans collateralized by securities 29,180 2, ,472 Consumer finance 2, ,014 Consumer 99,887 15, ,601 Real estate 18,148 6, ,227 Commercial and industrial loans 22,863 25, ,765 Financial institutions 19,327 3, ,666 Governments and public institutions ,281 Corporate & institutional 61,177 34, ,939 Gross loans held at amortized cost 161,064 50,357 1, ,540 Value of collateral 1 141,338 40, ,702 1 Includes the value of collateral up to the amount of the outstanding related loans. For mortgages, collateral values are generally values at the time of granting the loan. In the third quarter of 2014, Group credit risk management enhanced its internal credit rating methodology for lombard loans on the Swiss platform across all loan classes by considering the quality and diversification of collateral securities as a basis for determining the internal risk rating both for regulatory and financial reporting purposes. The change in the internal rating methodology for lombard loans on the Swiss platform did not have a significant impact on the Bank s total investment grade and non-investment grade loans. 26 414 Gross impaired loans by category Non-performing and non-interest earning loans Other impaired loans Non- Non- interest- Restruc- Potential performing earning tured problem end of loans loans Total loans loans Total Total 2014 (CHF million) Mortgages Loans collateralized by securities Consumer finance Consumer Real estate Commercial and industrial loans Financial institutions Corporate & institutional Gross impaired loans , (CHF million) Mortgages Loans collateralized by securities Consumer finance Consumer Real estate Commercial and industrial loans Financial institutions Corporate & institutional Gross impaired loans ,194 As of December 31, 2014 and 2013, loans held-to-maturity carried at amortized cost did not include any subprime residential mortgages. Accordingly, impaired loans did not include any subprime residential mortgages. As of December 31, 2014 and 2013, the Bank did not have any material commitments to lend additional funds to debtors whose loan terms have been modified in troubled debt restructurings. 28 416 Gross impaired loan details (continued) in Gross impaired loan detail (CHF million) Interest Interest Interest income income income Average Interest recognized Average Interest recognized Average Interest recognized recorded income on a recorded income on a recorded income on a investment recognized cash basis investment recognized cash basis investment recognized cash basis Mortgages Loans collateralized by securities Consumer finance Consumer Real estate Commercial and industrial loans Financial institutions Governments and public institutions Corporate & institutional Gross impaired loans with a specific allowance 1, , , Mortgages Loans collateralized by securities Consumer finance Consumer Real estate Commercial and industrial loans Financial institutions Corporate & institutional Gross impaired loans without specific allowance Gross impaired loans 1, , , of which consumer of which corporate & institutional , Restructured loans held at amortized cost in Restructured loans (CHF million) Recorded Recorded Recorded Recorded Recorded Recorded investment investment investment investment investment investment Number of pre- post- Number of pre- post- Number of pre- postcontracts modification modification contracts modification modification contracts modification modification Mortgages Consumer finance Commercial and industrial loans Total In 2014, a majority of the loan modifications of the Bank included interest rate reductions to rates lower than the current market rate for new loans with similar risk, partially in combination with extended repayment terms and/or amended collateral terms. Certain restructurings included a reduction of the principal loan balance and/or accrued interest. In 2014, 2013 and 2012, the Bank did not experience a default on any loan which had been restructured within the previous 12 months. 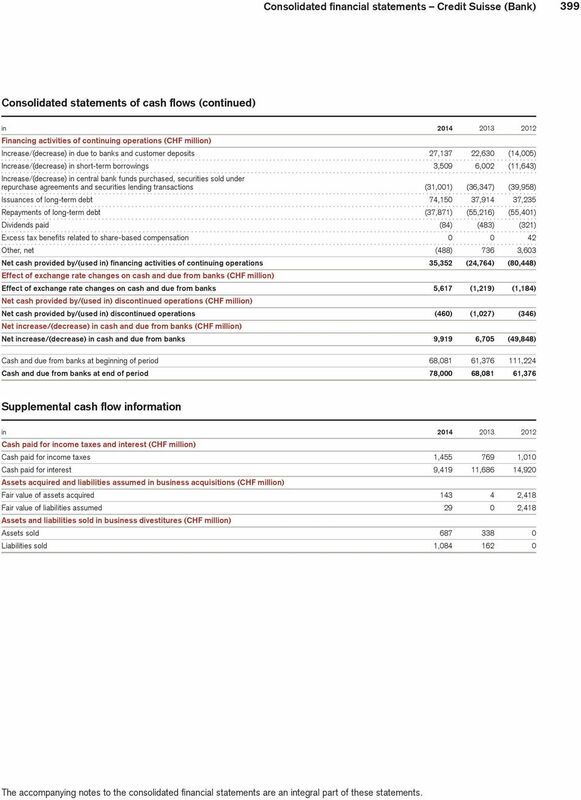 u Refer to Note 18 Loans, allowance for loan losses and credit quality in V Consolidated financial statements Credit Suisse Group for further information.